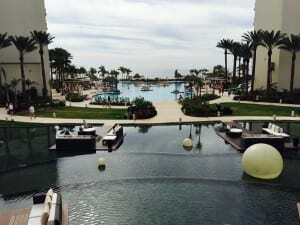 We just got back from 4 FREE nights at the Hyatt Ziva Los Cabos in San Jose del Cabo, Mexico. We scored these free nights by getting the Hyatt Signature Visa credit cards for both me and and my husband, Bob. 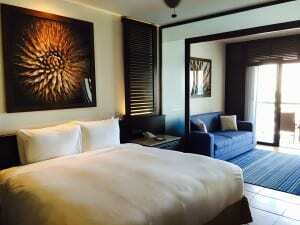 Each card comes with 2 free nights at any Hyatt in the world after spending just $1000. There is no annual fee the first year. So, to get the most bang for our buck, we decided to use them for an all-inclusive resort so we wouldn’t have to pay for food or drinks. 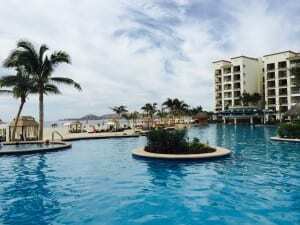 We flew to Cabo using Bob’s Southwest Airlines points and my Companion Pass. Two years ago I earned the Companion Pass for Bob, and now Bob earned it for me to use. (More on the Companion Pass program here.). The total cost for our 4-night vacation including airfare was $75. 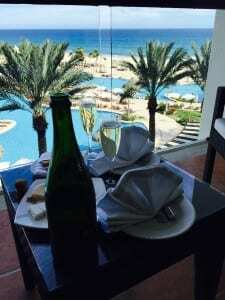 ($55 for RT transport from the Los Cabos airport to the hotel for 2 people plus $20 in taxes for our airline tickets.). The lowest available price for the resort on booking.com was $420 per night plus taxes. We were super pumped up to go to this all-inclusive resort. We went to a Barcelo property in Costa Rica several years ago that was very cheap and very disappointing. We assumed Hyatt would do it right and we are on a very tight travel budget this year after buying a new house last year so this would be a great opportunity to live it up on very little money. Upon arrival, the Hyatt didn’t disappoint! We used the Hyatt-recommended shuttle service, Transcabo, which was easy to arrange through the hotel and Transcabo whisked us from the airport to the hotel within 5 minutes of getting out of the airport. The exterior of the resort is well-maintained and impressive. The bellhops grabbed our luggage and escorted us to the front desk. Upon checking in at the desk, we were acknowledged as Platinum members (a perk with the Hyatt Signature Visa card) and directed to a private office to complete check in. At the private office, the staff told us of the special privileges that come with Platinum, including premium WiFi and the ability to make dinner reservations. Both of these privileges are key benefits at the resort, which I will explain. The huge lobby is open air with a view over several pools out to the ocean. It’s impossible not to be impressed! We were escorted to our room and given a tour along the way, learning about the coffee house, martini bar, various restaurants, etc. Over our years collecting hotel points, we never really know what kind of room we are going to get because some hotel programs give you a crappy room and others give you an upgrade. The Hyatt did right for us! We got a lovely room on an upper level with an excellent ocean view. Plus, we had a welcome gift of a chilled bottle of Spanish cava and a cheese plate. It’s funny because, while it was a nice treat, it doesn’t mean quite as much when drinks are free. Let me start with the Pros…the service is outstanding. The staff are extremely friendly and helpful. They are constantly moving taking orders, bringing drinks, giving directions, etc. They don’t stop moving and each one says hello every time they pass you. I can’t remember a time when I have experienced this level of service so widespread throughout a hotel. The resort says tips are included but I noticed a few people slipping staff money. In no way did the staff even hesitate to expect a tip but I’m sure they are appreciated. Another big pro is the resort itself–it’s gorgeous. The landscaping, the architecture, the sleeping rooms, the pools, etc. are all well maintained, clean and modern. It feels like a luxury property. The only areas lacking in aesthetic appeal are the restaurants. They felt a bit cafeteria-like to me, similar to a Las Vegas buffet. The other big pro is the level of drinks. I’m not a big hard liquor drinker so I can’t comment on the quality of the alcohol but the drinks were well made and they could make just about anything you ordered. Most of the time, it was easy to order a drink while laying at the pool or hanging out at the fire pits. The house wine was average but each restaurant had a wine list you could pay extra for special bottles. Another perk is a full re-stocked mini bar included in the deal. The biggest con for us was the inconsistency in the food. We tried a different full-service restaurant each night we were there and all but one had some dishes that were very good, but many dishes that were just average. The first night we went to the French restaurant. My portebello salad was tiny and not very flavorful; my lobster bisque had one piece of lobster and a watery consistency; and my main course of lamb chops were very good but the plate had only two small chops. I wish I had thought of ordering a double portion of chops. My husband’s foie gras appetizer was pretty good but very small; his French onion soup was very good; and his filet mignon was perfectly cooked but not very flavorful. For dessert he had a chocolate lava cake that was very good. The service was incredibly slow. The second night we ate at the sushi bar. There was nothing too exotic offered but everything tasted good. I would compare it to an average sushi bar in our town. All sake was an up charge so we stuck to free Mexican beer. Service was prompt. Part of the restaurant is a hibachi grill but it has a separate menu and requires a separate seating. The third night we ate at the Italian restaurant. I had the beef carpaccio, which was pretty tasteless; an arugula salad that was alright but nothing special; and for my main course I had the four-cheese pizza, which was average. Bob had a fried rice ball (I can’t remember the Italian name) that was tasteless and the rib eye, which was very flavorful but had even more fat than a typical rib eye. For dessert he had a chocolate “dome” that was great. Service was prompt but the setting was casual with picnic tables for part of the restaurant and bright lighting. The last night we ate at the steak house. It was buffet style so you have to stand at the buffet while the guy cooks your meat. It really bothered me that some people were getting served by a waiter so they didn’t have to stand at the buffet and wait. (The people who had waiters might have been Diamond members.) I waited about 5 minutes for my lamb chops, which actually were done too rare (rather than medium rare) and very fatty. We had expected a more romantic setting as it is situated on the beach but of all the restaurants, this was the most casual and chaotic. Both the quality and setting were very disappointing. As Platinum members we had the privilege of making restaurant reservations through a special staff member. If you are just a regular guest with no Hyatt status, you can’t make reservations and have to wait for a table to open up. This was a frustration for many guests because they were walking between restaurants to find out which had the shortest wait. Also, Hyatt needs to give up on their dress code for restaurants because about a third of the guests don’t follow it. I saw some hostesses turn people away and let other people come in even though they were all wearing shorts and t-shirts. In my opinion, the only restaurant that has an upscale feel is the French one; the rest or the “fine dining” restaurants are similar to an Applebee’s so a dress code is silly. We had room service for breakfast twice but they don’t serve the hot meals on insulated plates so by the time they get to you the meal is too cold even though the service is pretty prompt. The breakfast buffet is above average. We ate lunch at the Mexican place by the main pool (Coco Loco), which was really good and fresh. Another con is large corporate groups sometimes overrun the property. I read about this situation in advance and was worried. I didn’t experience it to the negative extreme that some people said they did, but the group events in the common public areas interfere with the relaxed atmosphere regular vacationers seek. For one evening event, the staff spent over an hour mid-afternoon sound checking the event music at the pool blasting sound bites over and over again. Fortunately, they got the sound right for the actual event and the event ended at a reasonable hour at night. There are a few activities included like daily yoga, water aerobics and a couple trivia contests. Considering how many guests are at the resort, these activities aren’t very popular. We did a tequila tasting that was interesting, but other than that we mainly hung out at the pool. The resort also has an evening show, which was very amateur (in my opinion). Even though the performers seem talented, the set, costumes and choreography are like a high school talent show. I overheard some people say they really liked the shows but we didn’t. The best price I found for a room during our vacation dates was $420 plus taxes for two people. If I had paid this price, I would have been disappointed mainly because of the food. I don’t have much experience at all-inclusive resorts so maybe this is a common problem. And I don’t think my standards are too high because I have experienced better food on both cruises I have been on. (Celebrity and Carnival) In my opinion, if a cruise ship can provide fine dining floating in the middle of the ocean serving thousands of guests, a resort on land in a popular destination should be able to at least match the quality. The bottom line for me is the Hyatt Ziva Los Cabos is a great points exchange or option redeeming free nights if you are looking for a nice, very low-cost vacation. Prev Walking the Camino de Santiago–My Favorite Vacation! How many SW points did you use? My husband, Bob, used 16,100 points for the round trip from Orange County to Cabo and I flew free (no point redemption) as his companion. We try to book travel as far out as possible so the flights can be booked with fewer points.